Minimalism is a tricky stunt to pull. Make it too minimal and it becomes just ambient noise. Make it too complicated and it becomes background music for a coffee & bookstore combo sofa being witness to a conversation about Céline. Veering a thin line between experimental ambient and minimalism is Kyle Bobby Dunn’s new album, Ways of Meaning. Six single songs, made mostly from guitars (processed until resembling cyborgs), organs (which should sound magnificent on vinyl) and electronic samples droning and intertwining until they create several passages that reflect moods and photographs fading. It’s hard imagining how it would sound live, but on recording it sounds like a very vivid, lucid dream. ‘Dropping sandwiches in Chester Lake’ is sparse, feeling like the wee moments of dawn when the hue changes, the shadows retreat and the sun comes out. ‘Statuit’ feels strange, like either the reverberated echoes of Matins prayers or the faded memories of an old school class where the blackboard was the last thing you paid attention to. Maybe your attention back then was totally focused on the drawings of UFOs in your math book, or a bugambilia tree looking golden in the morning sun, the one below the first thoughts about “why are we on this Earth” came to you (‘New Pures’). ‘Canyon Meadows’ feels like a distant memory surfacing. Not an entirely bad one, but certainly a powerful one. The drones build one on top of each other, looking like Hanoi towers by the end and then crumbling and fading out. It’s a long song (possibly as long as the distance between your present self and the moment that created the memory) but it never drags and it’s over sooner than you think. Now, a drone album needs a very long song to qualify as such  and this one has ‘Movement for the completely fucked’, a 14 minute mammoth of emotions and musical strata that again open the floodgates of memory. Your experiences may vary, but all these songs put me in a navelgazing mode that smells of faded photographs from my childhood. I might be a little biased with these sounds. Incidentally, ‘Touhy’s theme’ is an excellent album closer, feels like dusk, where the role reversal is that all the bright colours are now in remission and the only lights will be hanging from the sky. With a varied range of classical composers (Brahms, baby, Brahms!) being cited as influences, it’s no surprise that these songs have a good sense of harmony hidden in the dark recesses of their skeletal frames. Like a maze of hedges, Ways of Meaning looks simple and feels unchallenging, but once you’re inside it, you lose track of time and sense of direction. It’s like a foggy day on late November, it’s a drive near a lake on an overcast day, it’s a soothing collection of sounds and ghostly noises. 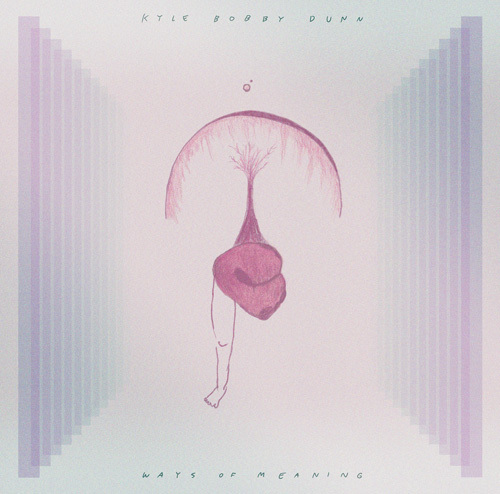 A passing memory fading in and out, with the emotion attached to it, yeah, that’s Kyle Bobby Dunn’s Ways of meaning, an emotion running through you. Posted in Apocalyptic stuff, Dreamy, Experimental, I need a hug, Reverb pedal: love it, reviews, The State of things...Tagged Ambient, experimental, Kyle Bobby Dunn, Peace through music, Soothing, Ways of meaningBookmark the permalink.